Air France Martin Cargo (AF-KL-MP) is poised to launch a same-day product on intra-European sectors that will use its baggage system for rapid cargo handling. The service has been tested at five airports and will cover 10 by next May, according to Christophe Boucher, senior vice president of sales and distribution. Starting in December, it will be offered initially out of Amsterdam to select customers, but both the client base and the network will be expanded, he says. Targeting markets within the European Union — which eliminates a need for import clearance — the new ‘12Send’ service is aimed primarily at the e-commerce and business to consumer (B2C) sectors, which have been identified as the chief drivers of this year’s surge in airfreight volumes. AF-KL-MP is not alone in its pursuit of e-commerce shipments. “We will do more with e-commerce around the world,” echoes Tim Strauss, vice president of cargo at Air Canada. Elsewhere, Atlas Air management told financial analysts last year that it was moving away from heavy freight and into the integrator, express and e-commerce market. Its subsequent engagement with Amazon has accelerated that move drastically. Besides boosting load factors on aircraft around the world, e-commerce offers carriers a chance to improve fleet utilisation. Their narrowbody line-ups may be useless for ULDs hauled on trunk routes, but they can readily carry small parcels. “You can use your entire fleet, not only the widebody fleet,” remarks Rick Elieson, president of American Airlines Cargo. 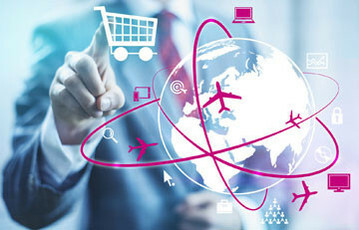 IAG is using its European narrowbody network to connect with e-commerce flows to and from other continents. AF-KL-MP has pursued a similar strategy, and the new 12Send offering will further boost narrowbody loads, Boucher says. While e-commerce is all the rage and fills their planes, it remains somewhat elusive for airlines. None of them have a clear picture regarding how much of it they are actually carrying, because a large proportion of it moves via mail and consolidations. “E-commerce is always difficult to identify. It comes in many flavours — from integrators, in mail, in consolidations,” Boucher confirms. For many carriers, postal agencies have been the primary clientele associated with this business. A spokesman for Lufthansa Cargo emphasises the airline’s co-operation with over 200 international postal organisations. “Some of our customers also use full charters to transport air mail and e-commerce shipments,” he adds. The lack of visibility as to how much of their traffic is actually e-commerce makes it difficult for airlines to gauge how much it contributes to their bottom line, but it is certainly not in the same bracket as pharmaceuticals in terms of yield. To begin with, the value of individual shipments is usually not high. Moreover, the cost pressure on e-tailers is intense, what with the cost of final-mile delivery, high return rates for some commodities and consumer expectations that delivery should cost little or be free altogether. Not surprisingly, Amazon may be coveted as a customer for its volume, but certainly not for what it is prepared to pay carriers and other logistics providers. One forwarder remarks that performing Customs clearance for the giant combines high workload with poor remuneration. The volumetric nature of most e-commerce is also a bit of a headache for carriers. Rather than applying only weight-based pricing, AF-KL-MP goes by chargeable weight or by contribution per cubic metre. Taking into account the volume of e-commerce shipments as well as their weight improves returns, but other loads may still offer juicier yields. “E-commerce margins per position are not fabulous. There are other product segments that provide a better return per position,” remarks Strauss. “That said, moving e-commerce goods creates the opportunity to fill under-utilised space and is therefore the right option in many instances. He adds that this would have to be done with partners, not by the airline on its own. Few carriers have ventured in this direction. One notable exception is China Southern Airlines, which launched an e-commerce platform two years ago called ‘Southern Cross-Border Purchase’ aimed at Chinese consumers who buy goods online from other countries. While it prepared for the start of its 12Send service, AF-KL-MP also invested in an express sorting system in Amsterdam that can process over 2,000 items per hour. It is designed to handle mail, express and pharmaceutical shipments. Another possible project in the pipeline, called Shipping Blue, looks at a to-door delivery service for passengers who are on AF-KL-MP’s Flying Blue frequent flyer programme — that is, some 25,000 people. According to Boucher, this would likely kick off within Europe first and later be expanded to the rest of the network. the carrier spends about €20m a year on IT. This is an important enabler for e-commerce business, remarks Boucher, pointing to multi-channel accessibility, instant pricing and booking capability, and track and trace functions. While projections for the sector’s growth remain bullish, it remains to be seen which way e-commerce is going to evolve. In the domestic arena Amazon has moved aggressively into the grocery business. This is not likely to play out internationally, but e-commerce logistics specialist Tigers has added wines, live lobster and fresh prime meats to its portfolio. Others shrink away in horror from food deliveries, noting the red ink at online food ordering firm Deliveroo, which saw its losses balloon from £30m in 2015 to £125m last year. The company registered sales of £128.5m but spent £127.4m on deliveries. Bob Imbriani, executive vice president international at forwarder Team Worldwide, expects direct international e-commerce shipments to grow, but argues that this is not the most efficient way to get goods to overseas customers. Increasingly, e-tailers are placing order fulfilment centres closer to consumers, and they seek to restock them using ocean carriers where possible, he points out. AF-KL-MP is riding the general wave of e-commerce growth through mail, integrator and forwarder volumes but wants to experiment with new avenues at the same time. Besides exploring opportunities, this should help the carrier to be ready — wherever e-commerce will take the industry, Boucher says.